In the last few years, many cigarette smokers have switched to using electronic equivalents of traditional cigarettes. Electric nicotine vaporizer devices are rapidly becoming more popular, with million being sold every month in the UK alone. Vaporizers are devices that deliver nicotine vapour by heating a nicotine infused liquid to create a steam vapour. Unlike electronic cigarettes which tend to look like and resemble tobacco shaped cigarettes, vaporizers are more like a pen shaped device. They have a battery, heater element, reservoir and a mouth piece. 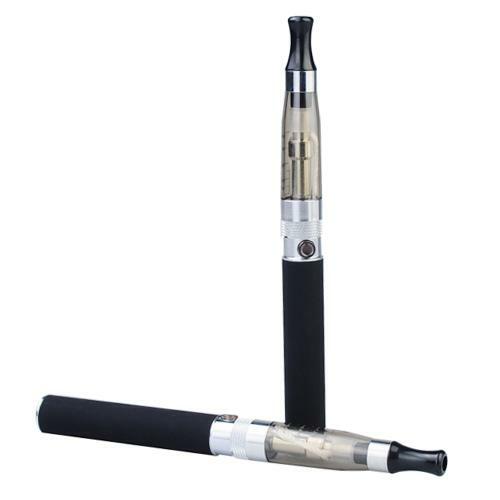 The problems with cigarette shaped electronic cigarettes are that they are limited in size (by the very nature of trying to be the same shape and size of a cigarette) and by the limited nature of the cartridges that they offer. With an electronic cigarette, you can only buy the ‘cartomizer’ cartridges that are supplied for the specific type that you buy. With a vaping pen, you have far more choices because you can add any eliquid of your choice to the reservoir tank and therefore smoke any blend that you choose. Because of the size issues, you also have far more flexibility with battery life because vaping pens have larger more powerful batteries than are possible within the size confines of an electronic cigarette. There are a huge selection of different eliquid flavours and strengths available, and because you are not tied to a specific manufacturer you are free to choose from any e-liquids from any manufacturers you prefer. E liquids have three main ingredients, Propylene Glycol, Nicotine and Flavourings. You can read more about the contents of vape eliquids here. There are increasingly more and more different flavours of e juice on the market, offering virtually every flavour imaginable. This massive choice of colours provides something for everyone meaning that no matter what your personal taste preferences, you will always have the taste you want at any particular time. The term vaporizer covers mains powered humidifier devices as well as hand held nicotine vaporizer pens. The term vaporizer describes any device that creates steam by heating a liquid using a heated element. Cigarette vaporizers consist of several components, a battery, heater element, eliquid reservoir tank and a mouthpiece. They come in many shapes and sizes, however, they all work in the same fundamental way. When you press a button, the heater element turns the eliquid into steam which is emitted through the mouthpiece. The two most important factors that affect performance are the reservoir size and the battery size. These are the biggest advantages that vaporizers have over cigarette shaped electronic smoking devices. Because they are not limited by their size and shape, vaporizers have a larger e-liquid reservoir tank as opposed to a cartridge that is usually only the size of a traditional tobacco cigarette filter and is preloaded with a small quantity of eliquid. The batteries of cigarette shaped electronic cigarettes form the white paper part of the cigarette, and are also limited in size because of this. Many cigarette shaped devices have short battery life because of this and are not capable of lasting for a whole day on one charge. Vaporizer pens have more flexibility as they have larger capacity batteries with a longer lifespan. While small batteries are available and offer 8 hours of usable time depending on the level of usage. These 8 hour batteries are compact and very useful for reducing the size of the device if you require a compact pen for an evening out for example. Larger capacity vaping pens are more practical for a whole days reliable usage. Bigger batteries typically last in excess of 24 hours easily offering even heavy smokers with long term vaping from dawn til dusk. Many batteries now include a charge indicator, as well as a heater control so you can adjust the heat used to make your vapour. Some flavours of eliquid can sometimes taste a little burnt if heated for too long, and an adjustable heating element gives you the control you need to create your perfect vapor time after time. Many smokers want to know how safe vaporizers are to use? Obviously compared to cigarettes they are a much less harmful way to get your nicotine. The ingredients in eliquid contain none of the 70 cancer causing carcinogens found in tobacco such as tar, arsenic, carbon monoxide (see full list of all 70 here), so compared with tobacco, e cigarettes and vaporizers are a much safer alternative. Because electronic cigarette devices have only been in use for a few years, it is very early to say that there are absolutely no negative effects related to vaping, but the ingredients are a much safer alternative to smoking tobacco. It is safe to say that not using nicotine in any form is the safest thing to do, but if you want to use nicotine then a vaporizer or e-cigarette is a far safer way to do it. 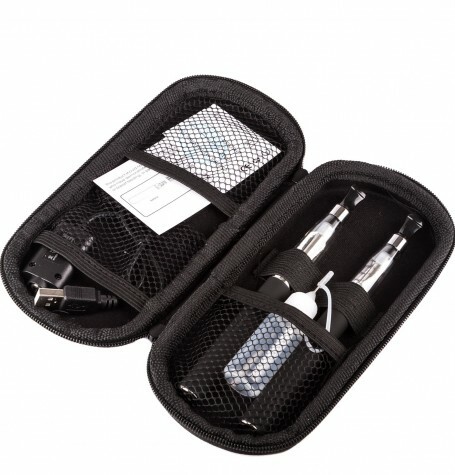 Choose from the best value vaporiser devices at www.electroniccigarettevaporizers.com and make the switch to tasty, flavoured nicotine and save up to 80% on the cost of smoking. 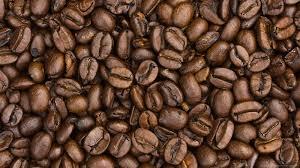 For coffee drinkers in the UK there are three basic options in terms of the quality of beans and grounds you can drink. We are not going to even discuss ‘instants’ as I don’t believe that anyone really considers any instant to be anything other than a cup of ‘hot brown’. 1 – High street mass market beans and grounds. 2 – Specialist Importers of Hand chosen beans for the ultimate experience. 3 – Quality pods offering convenience and practicality as well as taste and flavour. High end everyday beans and grounds, available on the high street include Lavazza, Illy, Douwe Egberts, although, manufacturers better known for producing instants are also trying to muscle in on the growth in the ‘proper coffee’ sector. Large high street chains including Costa and Starbucks also sell their popular beans both online and on the high street too. At the top end of the coffee drinkers menu are the more exclusive importers who usually hand select their stock from smaller, less well known, fair trade sources. Some specialist beans can be expensive, but that doesn’t appear to deter their growing market share. Imagine if you will, a large range of carefully selected beans from around the world. Grind and package those beans into individual pods, sealed for freshness, consistency and convenience and you have an individual pod system. A selection of different Ristretto’s, espresso’s, lungo’s and decaffinated’s ready to use with no mess, no waste and no hassle. Coffee was introduced into Europe in early 1600’s, brought back by merchants visiting the Middle East, first into Venice and then, rapidly spreading throughout Europe. 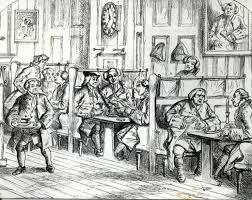 Coffee houses soon sprung up, especially in London, which back then had more than it does today. These houses were often the centres for business, with The London Stock Exchange for example, originating in Jonathan’s Coffee House in Change Alley which was frequented by many stockbrokers of the day, and likewise, in Lombard street, Edwards Lloyds coffee house eventually became the headquarters of what we know as Lloyds of London. These shops were (and still are) popular because of the preparation required to make a good espresso. The ultimate reason for the success of instants was the removal of the inconvenience, mess and time associated with preparation. Today if you want to enjoy a quality bean at home, you first need to grind the beans, and then use one of several different methods for passing hot water through those grounds at the right speed. Hence, many keen coffee drinkers chose a miniature version of the larger barista machines found in commercial shops and cafes. These do the same job as professional machines, but can be considered overkill if you are only planning to brew in small quantities. Although in literal translation, Barista in Italian means “Bartender” or “Bar Person”, in English our translation takes it to mean a trained Espresso machine operator. In addition to having a very detailed knowledge of espresso coffee preparation, a Barista must also be familiar with all the different drink recipe preparations from cappuccinos, Viennese, latte’s, and all the other different coffee drinks listed here. A Barista is to coffee what a Sommelier is to wine. These are great pots for use with your favourite beans or grounds. Just add the grounds of your choice, fill with water and heat on a gas or electric cooker ring for great result in a few minutes. While being an old school way of making your favourite brew, these Moka pots are simple but effective for all loose grounds. The Delonghi Dolce Gusto is a very compact and neat little machine. It takes pods that come in a large variety of different flavours and bean varieties. Personally I am not a fan of the Dolce Gusto milk pods which come with the milk based latte pods. 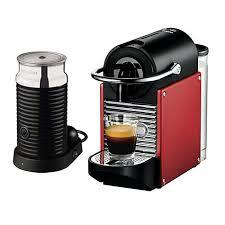 I prefer to use fresh milk and a milk frother such as the Aeroccino that is available from Nespresso. 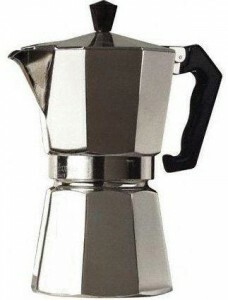 Lungo Intenso, Espresso Caramel, Choco Caramel, Espresso Macchiato, Espresso Macchiato Decaf, Grande Mild, Espresso Decaf, Caramel Latte Macchiato, Café Au Lait, Espresso Barista, Vanilla Latte Macchiato, Grande Intenso, Grande Caffè Crema, Americano, Cappuccino Ice, Espresso Intenso, Espresso Ristretto, Skinny Cappuccino, Skinny Latte, Espresso, Cappuccino, Latte Macchiato, Latte Unsweetened, Chococino, Mocha, Lungo, Lungo Mild, Lungo Decaf. 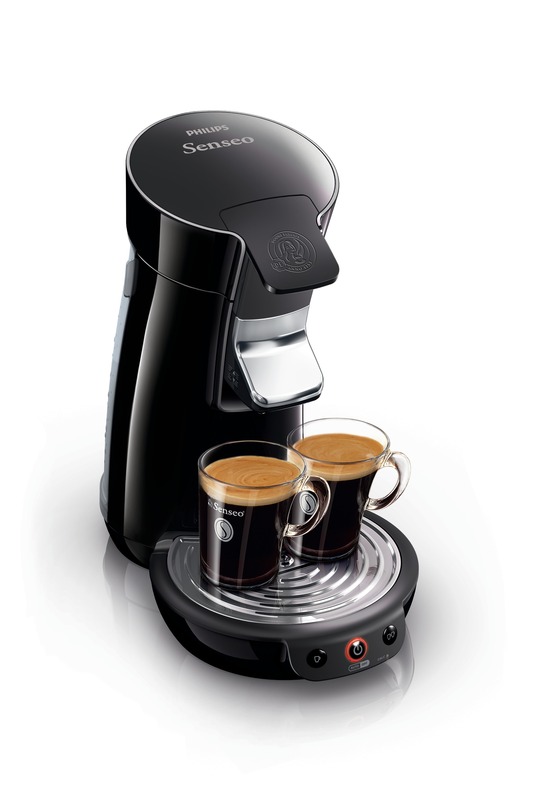 The Magimix Nespresso Pixie Coffee Machine is one of our favourites for a couple of reasons. Firstly they are lightweight and compact machines that still have a good sized water tank and secondly, the choice of different grounds is extensive and the quality is consistent and above average. 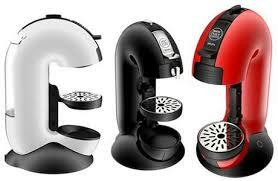 These machines are made by Krups and Magimix, with DeLonghi manufacturing some of their larger machines. Nespresso provide free recycling bags so you can easily store all your used nespresso pods which Nespresso will then collect when they deliver your new pods. It is a very good system which we have found works very well. Intenso: Kazaar, Dharkan, Ristretto, Arpeggio, Roma. We love Francis Francis machines. Not only are they beautiful sculptures that are stylish additions to any kitchen, but they let you play at being a real Barista with the whole, bang, grind, scoop, press, experience. These are heavy weight, high quality gadgets that you will love to own. The only fly in the ointment that we have found is that they seem to be more sensitive to limescale build up than some other machines and if neglected then the heater element will fail. If you buy one of these and live in a medium to hard water area then be sure to descale monthly and you will have years of pleasure from this delightful product. Dark Roast, Medium Roast, Decaffeinated, French Vanilla, Vienna: Hazelnut Waltz, Sumatra Blend, Colombia, Kona Blend, Espresso, Breakfast Blend – 4 Pack of 18ct Pods. Whatever machine you decide to choose, the one thing that they all have in common is that over time they will need to be descaled. If you don’t descale your machine, then two things will happen, firstly you will find that slowly, over time, the quality of the coffee your machine produces is affected. Secondly, if left to scale up then in time the heater element in your machine will fail and need to be replaced. Depending on the hardness of the water in your area, you should descale every 30 – 90 days for best results. We all know only too well that smoking tobacco is bad for us, there is only one probable outcome.Cancer rates in smokers exceed those for non smokers & are more severe. There has been a lot of press recently about the alleged dangers of e-cigarettes and potential safety concerns.Around the world, the tobacco industry continues to exercise considerable influence. In the UK we have a Government that is prepared to risk strangling industry with health and safety red tape in order to mitigate a small risk to workers, while at the same time ignoring the 100,000 annual deaths that are caused by smoking. Tobacco currently earns the Government £12.1 Billion annually, and that money would have to be found elsewhere if smoking was to be banned. It seems logical to therefore conclude that our Politicians will protect us from ourselves unless there is a powerful economic reason for not doing so. It would be highly unlikely that e-cigarettes will escape regulation completely because with their use growing as rapidly as it is, being able to tax e-liquid must look very inviting to the Chancellor. Currently a bottle of e-liquid costs £4.99 and is the direct equivalent of about 200 cigarettes. 200 cigarettes would cost you £60 – £80 depending on your preferred brand, so the saving at present are significant. It is the smoking cessation industry that seems to be behind the majority of the anti e-cigarette press and publicity. The tobacco companies have remained quite quiet on the subject to date. It’s difficult to argue that a new product might not be 100% healthy when you are selling a product that is proven to kill people! In order to effective tax e-liquid, the Government needs to be able to control its supply and regulation would make that possible. However, because it’s possible to make your own e-juice from high street ingredients, will this make e-cigarettes untaxable and therefore more likely to be banned? So where does all this leave us? What is in store for e-cigarettes in the months and years to come? Will they become mainstream smoking devices or be banned by law and consigned to the annals of history? Time will tell. One thing is for certain, it won’t be health considerations that ultimately decide their fate but finance, taxation and business. It seems unlikely that e-cigarettes and vaporizers will escape regulation. This is mostly because they have the potential to significantly reduce the tobacco tax revenue the Government receives annually. If that revenue can’t be replaced, then regardless of whether e-cigs are less harmful or not, the financial implications of their usage would be to great to tolerate. The use of electronic cigarettes has been steadily growing because more and more smokers are realising the benefits of using an e-cigarette or vaporizer. Since the March 2013 UK budget, a packet of 20 cigarettes costs arounf £8 depending on the brand you smoke. That works out to £80 per 200 cigarettes. For the sake of argument, let’s say you smoke a cheaper brand (and who wouldn’t at those prices? ), so 200 are currently costing you £60. Once you have bought an e-cigarette or vaporizer (you can get an e-cigarette starter kit for £19.99 online), the only cost you have is for bottles of e-liquid, which come in 10ml bottles for $4.99 each. Each 10ml bottle of e-liquid is the equivalent of 200 cigarettes, so even against a cheaper brand, you will be saving £55 per 200 fags! E-liquids come in 4 strengths of nicotine so you can wean yourself off nicotine if that’s what you want to do. E-juice also comes in an ever growing range of tastes and flavours, so you aren’t just stuck with tobacco flavour, but can try different fruit flavours, coffee, chocolate, vanilla etc. Electronic cigarettes deliver nicotine without the additional carcinogenic nasties that are present in tobacco. You don’t get Tar, Carbon Monoxide, or the other poisons and chemicals that are present in cigarette smoke. This makes vaping a much less harmful habit than smoking. The long term effects of using electronic cigarettes are still unclear, and no one is saying that using a vaporizer is 100% safe and healthy, but when compared to smoking cigarettes, using an e-cigarette minimises many of the known risks to your health. In addition, e-cigarettes do not pose a threat by way of passive smoking because they give off water vapour, with minute traces of nicotine, which in isolation isn’t more harnful to us than caffeine. Electronic cigarettes and vaporizers bypass the current UK anti-smoking laws, allowing you to get a nicotine hit in many of the places where smoking in banned. In time, the UK government will extend the smoking ban to include, private cars and driving, private homes, and who knows where else. E-cigarettes allow you to ‘smoke’ in public building, so you will no longer have to stand outside in the cold like a social pariah, huddled around an ineffective patio heater in a smoking shelter next to some grimy pub toilets! Because e-cigarettes are so much safer than smoking, you can use your vaporizing device in many more places. This is one of the main reasons for thieir rapidly growing popularity. Find your ideal electronic cigarette starter kit and get vaping today! Drink driving? This may be the first time you have been faced with any kind of prosecution and we understand how you probably feel right now. 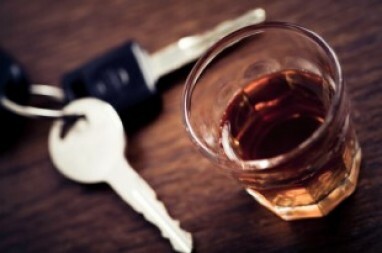 Please get in touch with a team of expert drink driving solicitors for a free consultation. It is vital that you seek advice from expert solicitors with particular expertise in drink driving cases involving blood and urine samples or any of the three breathalysers in use across the country’s police stations. Check the printout the police should have offered to you for details of which drink driving device you were breathalysed on. I HAVE BEEN CAUGHT DRINK DRIVING, DO I NEED A SOLICITOR? The decision is yours. Ideally you should make arrangements and seek advice from a solicitor at the police station when you are detained and before you make any formal statement. There is always a duty solicitor available on call 24 hours a day who provides free legal advice to people detained at the police station. The police will ask you if you want to see a solicitor. You can ask to see a duty solicitor. These are on call 24 hours a day and provide free legal advice to anyone that needs it. Seeing a duty solicitor at the police station is free of charge no matter how much you may earn or have in savings. You can ask to see your own lawyer or one you have heard of. You can ask the police for their local list of specialist motoring lawyers if you do not have your own or you don’t know of any locally. You can choose not to see a solicitor at the police station. If you choose not to see a solicitor at the police station and you are charged with a drink driving related offence then it is usually in your best interests to find an expert in drink drive offences to represent you in court, this should be done as soon as possible after you are charged. The reason that you might want to use a specialist rather than a general practice lawyer is because they will be able to help and advise you on ways that you are able to help avoid you losing your licence, or minimise the loss of your licence. Special reasons can be argued by the driver to avoid a ban for exceeding the drink drive limit in some cases where no legal defence is available. A criminal record may be avoided and your legal fees reimbursed in some cases. Some drivers may feel they had no alternative but to drive whilst they were over the limit. Where this happens you may be able to argue “special reasons” as a way of avoiding a driving ban. The typical cases involve some kind of emergency. If you need expert advice from a proven motoring law specialist, ask Patterson law a free, no obligation question about your offence circumstances and let them guide you towards the best possible outcome. Points on driving licence is a demerit point system is one in which a driver’s licensing authority, police force, or other organization issues cumulative demerits, or points to drivers on conviction for road traffic offences Points may either be added or subtracted, depending on the particular system in use. A major offence may lead to more than the maximum allowed points being issued. Points are typically applied after offences are committed, and cancelled a defined time, typically a few years, afterwards, or after other conditions are met; if the total exceeds a specified limit the offender may be disqualified from driving for a time, or the driving license may be revoked. Fines and other penalties may be applied additionally, either for an offence or after a certain number of points have been accumulated. points on driving licence for new drivers act essentially puts newly-qualified drivers on a two year period of probation. If you get six or more points on your licence in the two years after you passed your test, you’ll automatically lose your licence and become a learner driver all over again. You will have to start from scratch; you’ll even need to apply for your provisional licence again. If you lose your licence and then pass a retest, you will not be subject to a second period of probation. Totting up points can be quite easy for new drivers if they are not careful and the penalties for new drivers are quite strict. Because you will be required to retake your driving test if you collect 6 points for totting up, the financial cost is also high. One missed payment or failed direct debit to your insurance company can cost you your driving licence in the first two years after passing your test. There are a few steps you can take if you find yourself in this situation. Don’t accept a fixed penalty for a no insurance offence for example, as you will lose your licence and it can’t be revoked or returned without a full retest. If you are accused of an offence that will take you towards 6 points, ask for free advice from leading new driver lawyers, Patterson Law and find out if you can defend your accusations? Yes, not even your provisional licence is safe from the dreaded points. 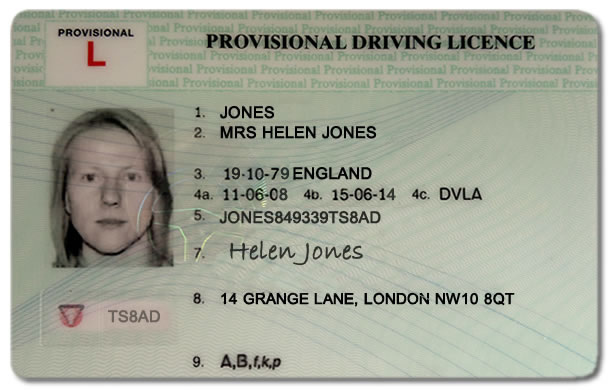 Any points you get on your provisional licence will last for three years and will stay on there when you pass your test, putting you more at risk of falling foul of the new drivers act. If you somehow manage to get six points on your provisional licence, it won’t be taken away from you. However, once you’ve passed your test you’ll have to avoid getting any more driving licence points for two years to avoid losing your licence and having to start again. The following offence codes must stay on a driving licence for four years from the date of offence. 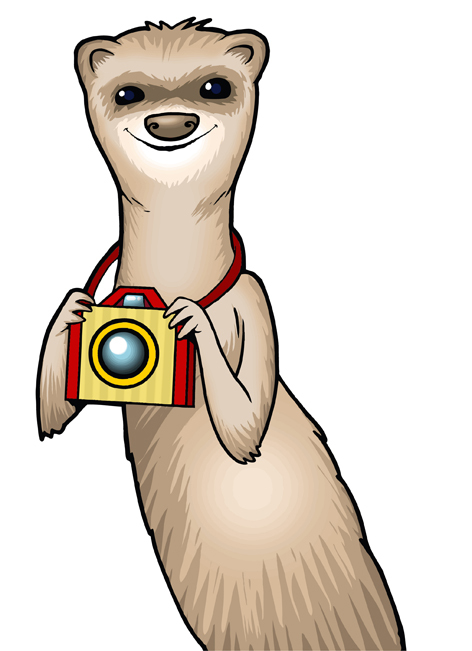 January 2013 sees the launch of a brand new online i spy game called Viespy. Played using a smartphone or with a camera, players (called Agents in the game) have to find a series of 10 items from different lists, and take photo’s of them. 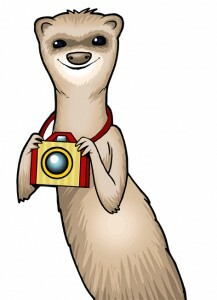 Photo’s are then uploaded via either the iPhone App, the Android App or from a camera straight into a PC. Each collection of 10 items is called a mission, and your photo’s are uploaded into that mission where you score different points for each depending on how easy or difficult each item is to find. The viespy.com website keeps a score for each person playing that mission and produces a scoreboard which also measures how quickly photo’s are uploaded. Points are won depending on how high you finish in the mission. Every time you win 100 points, 300 coins are added to your coinbank, which allows you to buy play against more people. Signing up is totally free and the game only costs you money if you want to play set up more than 5 Spyrings or play a mission against more than 5 people in a Spyring. Even then, it doesn’t cost more then a couple of pounds and you can win the coins you need to buy more functionality by playing “Public Missions“. If you play lots of public missions, you won’t need to spend any money to buy Viespy coins. Public missions are played against the whole world rather than between your friends, and you earn 100 points for each public mission that you complete. There are hundreds of “Public Missions” to play, with more being added all the time. Playing the Viespy online I Spy Game is easy once you understand the basics. You can create your own missions to play against your friends, or you can copy a “Public Mission” into one of your Spyrings and use that instead. Viespy is going to be the big Smartphone game of 2013, so start playing today and let your imagination run away with you…..
Bookends, for all their whimsical designs, had practical beginnings. While today’s bookends are a mix between the beauty of visual form and the performance of a necessary function, centuries ago bookends mostly just kept people from getting hit on the head. During medieval times, books were really only found in monasteries and a few other scholarly locations, as books required a great deal of time and special skills to produce. Books were chained in lecterns and study areas and read on slanted surfaces in carrels (no place for bookends!). Around the end of the Renaissance, books began to be readily available to more and more people. Those lucky enough to have a very great – or even a very small – collection of books, generally kept them together, as they were still quite valuable. Before books became so much more regular, a small pile of books might be stacked flat, or horizontally; but as the quantity of books increased, forming mountains of books didn’t seem to make much sense, even just considering safety reasons. Shelves and book chests came into use; eventually books began to be stored vertically by the end of the 16th Century. As libraries and collectors formed categorical systems for arranging books, and shelves grew taller and more accommodating, bookends became a means for keeping books neatly horizontal on an otherwise unfilled shelf. Bookends of sufficient weight would keep the shelved books safely in place and reduce book avalanches, making vertical book storage and the use of bookends a definite improvement over horizontally stacked book mountains. People today generally don’t depend on bookends to save their heads from harm. Most sets of bookends serve simply to keep bookshelves tidy and add decorative complement. 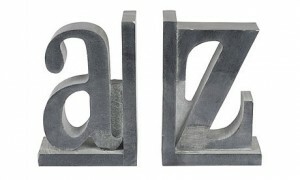 A set of bookends might be chosen to balance a particular display of books, those with collectible or very personal value. Many book lovers are also lovers of bookends and might become collectors of both. Finally, with all of the styles available today, bookends might be chosen simply because they reflect a certain theme – nautical, sports, cowboys, circus, etc – or because the bookends complement a decorative style like art deco, rustic, modern or romantic. It’s easy to fall in love with a set of bookends before books even come to mind. Bookends certainly had practical beginnings, and they still serve the same practical purpose today. 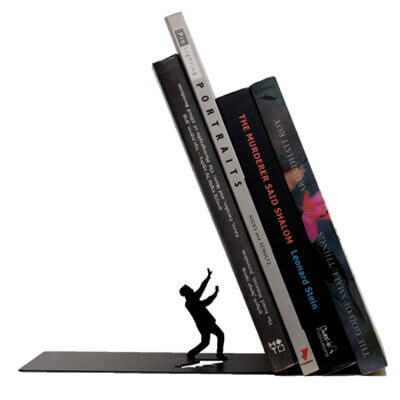 However, today’s bookends can add fun and stylish flair to any room of a home or office. Body art is everywhere and most people can name at least one person they know who has some kind of body work done. People with tattoos work in a variety of industries and hold entry-level jobs, as well as, top executive positions. Based on the number of new tattoo parlours and the number of people getting tattooed, this trend doesn’t appear to be slowing any time soon. So, is body art a workplace issue? Does having a visible tattoo say anything about an individual that is relevant to his or her job? 1. Do you think that tattoos and/or body piercing hinder ones chances of finding a job? 85% answered Yes and only 15% – No. 2. How do tattoos and/or body piercing affect the opinions of co-workers and employers? Hinder said 64%, No Effect – 34% and Helped – only 2%. Reactions to tattoos in professional situations seem to be highly dependent on the specific industry and the employer. Even though tattoos are becoming more acceptable in the workplace, there are still some customer service industries that are concerned that employee with tattoos can affect their business (for instance, in retail they may startle children). These types of businesses should have a policy on tattoos and body piercing where they clearly explain the company rules. Employers with dress code or other grooming policies should review their policies frequently and make sure all managers are consistently enforcing the policies. When you are going to a job interview we recommend you to cover up tattoos and remove body piercing when interviewing. While dress codes have loosened, companies still expect candidates to look professional in an interview. That is not the only reason why candidates should cover up their body art when interviewing; you do not want to distract an interviewer. People want interviewers to focus 100% on their qualifications and not be taken aback by their appearance. While we should expect body art to gain further popularity and acceptance, we should remember that it does affect getting a job. So it is best to think twice before having it done. While times are changing not all things have, so plan your future body art. If you are entering a career field that recognizes and even appreciates artistic expression, you probably don’t need to worry about it. However, if you are applying for a customer service job, for example, it would be prudent to keep your artistic side to yourself. Among the best-known pest species are the American cockroach, Periplaneta americana, which is about 30 mm (1.2 in) long, the German cockroach, Blattella germanica, about 15 mm (0.59 in) long, the Asian cockroach, Blattella asahinai, also about 15 mm (0.59 in) in length, and the Oriental cockroach, Blatta orientalis, about 25 mm (0.98 in). Tropical cockroaches are often much bigger, and extinct cockroach relatives and ‘roachoids’ such as the Carboniferous Archimylacris and the Permian Apthoroblattina were not as large as the biggest modern species. Cockroaches live in groups and are attracted to humidity, warmth and darkness, and are common in bathrooms, kitchens, dining rooms and sometimes bedrooms. Cockroaches secrete a pheromone (an attractant chemical) in their faeces, which attracts other cockroaches. Cockroaches dislike light and hide as soon as a light is turned on in a dark room. This habit can be used to find their hiding places. Egg cases (Oothecae) of some species of cockroaches can be found cemented to and/or dropped inside kitchen cabinets, behind refrigerators, and under or behind stoves. Though not all types of cockroaches drop their egg cases, empty shells of egg cases are an indicator of their presence. What do cockroaches feed on? 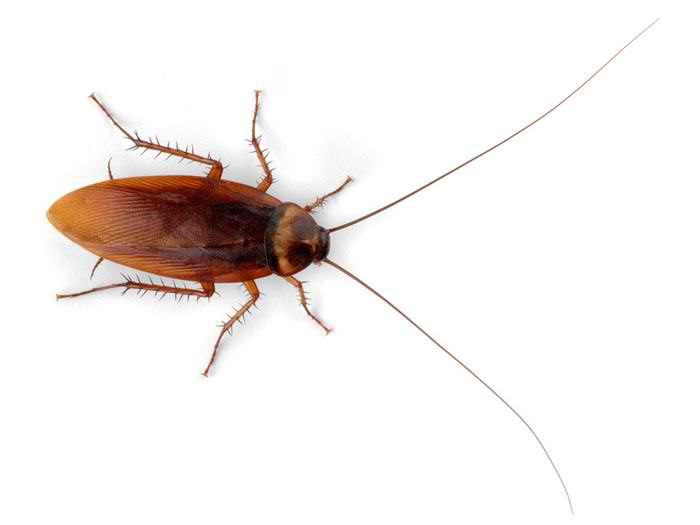 Cockroaches feed on a wide variety of food (grease, crumbs, pet food, wax, gum, leftover food in empty food cans etc.). They also eat paper if it has glue on it, and some will feed on soap bars. Cockroaches can withstand long periods of starvation and can live for many days without water. Cockroaches are scavengers. While walking on spoiled food in garbage containers, they pick up various bacterial organisms on their legs that they can later deposit on uncovered food. Cockroaches themselves are not implicated in the transmission of any diseases. However, many disease-causing organisms can grow and multiply in their guts and can then be deposited on silverware, plates etc. during defecation. For example, cockroaches can pick up disease-causing bacteria like Salmonella on their legs and later deposit them on foods and cause food poisoning. People continuously exposed to dust containing cockroach feces and crushed body parts become sensitized and may show allergic reaction and asthma after repeated exposure to such dust. How can I control cockroach infestation in my home? 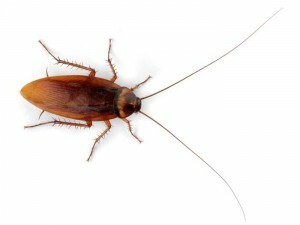 The key to prevent cockroach infestation indoors is sanitation both in and around the house. Empty garbage daily and keep the lid tightly closed at all times. Do not accumulate empty soda cans, beer bottles, food cans and especially not in brown paper bags and cardboard boxes inside the house. Tape openings around pipes under the kitchen and bathroom sinks to prevent infestation from neighbouring apartments. To prevent the entrance of cockroaches into homes: eliminate potential habitat areas outside the houses; seal cracks; and install screens on vents, windows and doors. Baits are a safe way to control an infestation inside the home. Place bait under your refrigerator, behind and under the stove, and in the basement. Baits contain slow-acting poison that kills any cockroaches that eat it. Once poisoned, they usually salivate or defecate in their nest area, depositing poison that will kill other cockroaches. Boric acid is used to control cockroaches, but its proper placement and use is essential to ensure its effectiveness. It can be purchased as boric acid insecticide formulations from hardware and grocery stores. The insecticide formulation packaged in plastic, squeezable bottles with narrow nozzles is the safest and easiest to use. Boric acid should be applied as a very thin layer of powder that the cockroaches cannot distinguish from dust. Apply it under and behind refrigerators, stoves, dishwashers, washing machines, cabinets, areas where plumbing pipes enter the floor, under sinks, etc. Do not apply it in areas where you prepare and/or store foods. Boric acid is a poison, so you should always store and apply it properly, especially if you have young children. 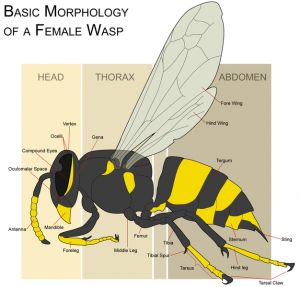 Generally, wasps are parasites or parasitoids as larvae, and feed on nectar only as adults. Many wasps are predatory, using other insects (often paralyzed) as food for their larvae. In parasitic species, the first meals are almost always derived from the host in which the larvae grow. Several types of social wasps are omnivorous, feeding on a variety of fallen fruit, nectar, and carrion. Some of these social wasps, such as yellow jackets, may scavenge for dead insects to provide for their young. In many social species, the larvae provide sweet secretions that are consumed by adults. Adult male wasps sometimes visit flowers to obtain nectar to feed on in much the same manner as honey bees. Occasionally, some species, such as yellow jackets and, especially, hornets, invade honey bee nests and steal honey and/or brood. Although 11 species of true wasp are found in Europe, only two, the Common Wasp (Vespula Vulgaris) and the German Wasp (Vespula Germanica) are important as pest species. Both species overwinter as queens, the Common Wasp usually hibernates in buildings and the German Wasp typically overwintering under the bark of trees. In spring the overwintering queens leave their hibernating quarters to seek nesting sites which could be in a hole in the ground, a hollow tree or artificial structures such as eaves, lofts and attics, garden sheds etc. The queen starts to build her nest with a papery material that she makes by chewing small pieces of wood mixed with saliva; this is known as Wasp paper. She will raise the first few workers by her own efforts and those workers will then commence the enlargement of the nest and caring for the immature Wasps to follow. Nest construction starts in earnest in June and will reach its maximum in size in September, when 5 – 10,000 workers may be present. These workers will forage for food up to 400 metres from the nest. 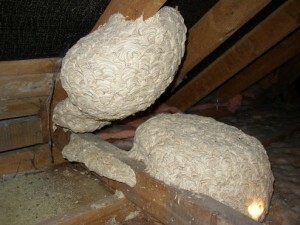 The size of wasp colonies will vary from year to year, the severity of the previous winter is probably the key factor. In the Autumn the young queens mate and leave the nest to hibernate, the rest of the nest dies out and the nest is never used again. Individuals react differently to being stung by wasps; some are hardly affected, others suffer considerable pain and swelling and a few become seriously allergic to being stung, which in some cases results in sudden death due to anaphylactic shock. It is always advisable to let a professional Pest Control Officer deal with a Wasp nest for the reasons mentioned above. An insecticide will be used to cover the entrance to the nest. 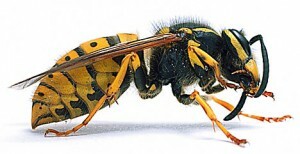 Returning wasps will carry the insecticide into the heart of the nest and within a few hours all wasps should be dead. Finding the nest is not always easy but following the flight pattern from a source of food could prove helpful. If a householder elects to treat the nest themselves, treatment should be carried out early or late in the day when the Wasp activity is at a minimum. Hardware shops and garden centres will sell insecticide sprays and powders for the treatment of Wasps but care must be taken to follow the instructions on the label. I am often asked how to keep cats away from yards. Cats are unpredictable, so there are few sure-fire cat repellents. But below I consider some of the best approaches known to keep cats away from yards. Broadly speaking, we can label all of these diverse approaches as “cat repellents,” since they are all designed to repel unwanted feline intruders from a specific area. But I’ll also provide an example of the commercial products more narrowly associated with the label, “cat repellents,” namely, products that come in a can and are sprinkled on the ground to keep cats away. If you haven’t planted a flower bed yet, but you anticipate having trouble keeping cats out of your yard, be aware that one of the most effective cat repellents is readily available at most any hardware store: chicken wire. No, I’m not going to suggest you erect a chicken-wire fence. Instead, lay chicken wire down on top of your soil (or mulch, if you’re using mulch in the bed), across the planting bed, before you plant. Why? Because cats disdain walking on chicken wire. Using wire cutters, you’ll be able to open up pockets in the chicken wire sufficiently large for installing your plants. But what if it’s too late for the chicken-wire option? Not to worry. The ten cat repellents on which I focus below are all intended for existing garden beds. While on the subject of wire, I’ll begin with electric wire fences. 1. Like rabbits, cats can be kept away humanely with the Mr. McGregor Fence. This fence is so safe that even Responsible Consumer.Net recommends it. Water: The Ultimate Cat Repellent? Sometimes, to keep cats away from a yard, you have to think like a cat. Put yourself in the cat’s place. Observe cat behaviour. For instance, they’re pretty fussy creatures, aren’t they? One of the things cats are fussy about is getting wet. Water is “kryptonite for cats.” Getting wet seems to be almost a phobia for them. Use that phobia to your advantage in trying to keep cats away from yards. 2. When you catch cats in the forbidden area, you can try hosing them down with a Super Soaker or similar water gun. Such action may reinforce the notion that they are unwanted in your planting bed. 3. But if that doesn’t work, you can go hi-tech. Devices such as Scarecrow Sprinklers detect an intruder’s presence and fire a blast of water at it. 4. One of the commercial cat repellents available is a powder called, “Shake-Away.” Shake-Away bears the scent of the urine of predators that cats fear, namely, the coyote, the fox and the bobcat. 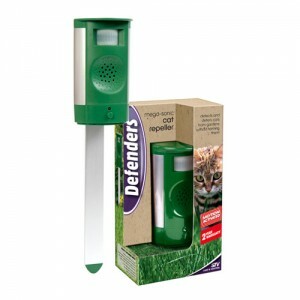 This commercial cat repellent comes in a granular form, which you simply sprinkle around the problem area. The product is advertised as being organic, making it an acceptable option to use around children and pets. Nor will it harm your plants. Note that mothballs are toxic, thus the recommendation that you use them in a covered can or jar. Avoid even this usage if small children will be in the yard and could, potentially, open such a can or jar. Note also that some people caution against using cayenne pepper in this fashion, saying it can be harmful to cats. So if you’re an animal lover or tend to be on the cautious side, then save the cayenne pepper to flavour your food! Still “thinking like a cat” to figure out how to keep cats out of gardens, let’s consider something else cats are fussy about: the texture of what they step on. After all, it’s not for nothing we have the expression, “pussyfooting around.” I already mentioned chicken wire in this context. 7. Cats don’t like to walk on bristly material. So in mulching the problem bed, include something on which the refined paws of cats will fear to tread, such as sharp-edged pine cones. 8. Another mulch-related idea is to use stone mulch. 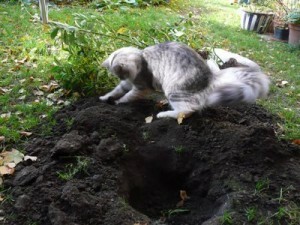 It may not be the most attractive mulch for your particular bed, but cats prefer to poop in loose dirt. Cats usually won’t bother with an area mulched in stone. They’d rather be “pussyfooting around” where the digging’s easier on their paws. As in landscaping with dogs, sometimes the path of least resistance provides the best solution to your problem. Strike a compromise with your cat by planting a separate bed of catnip plants, in another part of the yard. Not all cats go nuts over catnip plants, but those who do may come to view their “catnip patch” as their own private sanctuary. 9. Better still, make a sandbox just for cats and keep it in close proximity to the catnip plants. Chances are that the sandbox will serve as a magnet for cat poop. Sure, you’ll have to clean up the cat poop afterwards. But at least you’ll know where it is. Hi-tech approaches to keeping cats out of gardens don’t stop with the motion-activated sprinklers mentioned. You can also keep cats out of gardens using ultrasound. 10. Simple to install, this sonic cat scarer can be set up within seconds. Effective in all weather conditions, it also provides 50% more coverage than other cat repellers on the market. One unit can protect a garden of up to 40 feet in length. For larger gardens the repeller can be used solely to target problem areas or in multiples to cover the entire area. The ultrasonic frequency emitted is inaudible to humans, so will not hinder your enjoyment of your outdoor areas. During the summer months these flies live and breed in grassy fields and are seldom noticed. In the autumn they would, under natural conditions, hibernate in dry sheltered areas such as under loose bark or in hollow trees. The survivors of the winter would then emerge the following spring to return to the grassy fields to continue their life cycle. However, with the encroachment of housing onto green field sites bordering pasture land it is quite common in the autumn for these flies to collect in large numbers on the outside of buildings, especially on sunny, light coloured walls. As the night time temperatures begin to fall they tend to crawl into crevices for shelter, sometimes through ill fitting windows and frames, but mainly under the eaves/fascia boards into the roof space. The following days they may emerge and sun themselves but finally they remain inside until the process is reversed the following spring. These flies may then be discovered when you enter your attic (to retrieve your Christmas decorations?). Your attic light is enough to make some think spring has arrived and they will sleepily buzz around. This usually kills them as they use up vital energy which is needed to keep them through the winter. 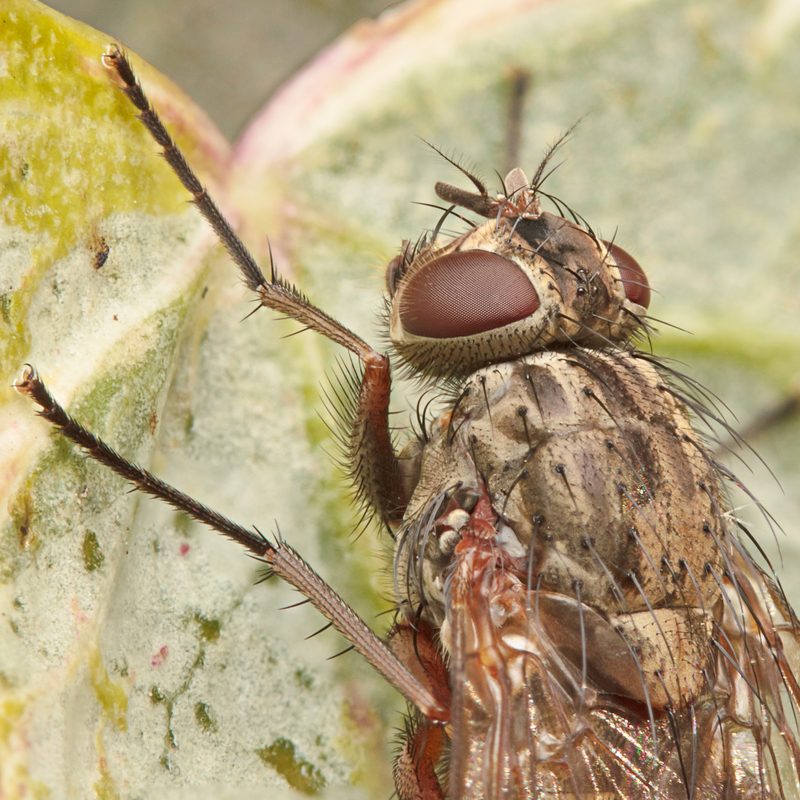 My House Is Affected By Cluster Flies – What Should I Do? Any water storage tanks in your roof are properly covered to prevent flies accidentally falling in. Loft hatch/doors to roof spaces are a good fit to prevent flies coming down into the house as they will be attracted to warmth and light (this also applies to ceiling light fittings). Do not attempt to seal your roof space against the entry of these flies. Your roof space needs good ventilation to prolong the life of its timber and prevent condensation. Any accumulation of dead or dozy flies are best removed by dust pan and brush or vacuum cleaner. Smoke Bombs are a highly effective cluster fly killing fumigation device, ideal for flushing out cluster fly infestations from lofts and roof spaces. It has been known that fleas do not use muscle power but energy stored in a protein named resilin but the researchers used high-speed video technology and mathematical models to discover where the spring action actually happens. Their bodies are laterally compressed, permitting easy movement through the hairs or feathers on the host’s body (or in the case of humans, under clothing). The flea body is hard, polished, and covered with many hairs and short spines directed backward, which also assist its movements on the host. The tough body is able to withstand great pressure, likely an adaptation to survive attempts to eliminate them by mashing or scratching. Even hard squeezing between the fingers is normally insufficient to kill a flea. It is possible to eliminate them by pressing individual fleas with adhesive tape or softened beeswax (or “cheese” wax) or by rolling a flea briskly between the fingers to disable it then crushing it between the fingernails. Fleas also can be drowned in soapy water. Fleas lay tiny white oval-shaped eggs better viewed through a loupe. The larva is small, pale, has bristles covering its worm-like body, lacks eyes, and has mouthparts adapted to chewing. The larvae feed on various organic matter, especially the feces of mature fleas. The adult flea’s diet consists solely of fresh blood. In the pupa phase, the larva is enclosed in a silken, debris-covered cocoon. Fleas are a nuisance to their hosts, causing an itching sensation which in turn may result in the host attempting to remove the pest by biting, pecking, scratching, etc. in the vicinity of the parasite. Fleas are not simply a source of annoyance, however. Some people and animals suffer allergic reactions to flea saliva resulting in rashes. Flea bites generally result in the formation of a slightly raised, swollen itching spot with a single puncture point at the centre (similar to a mosquito bite). The bites often appear in clusters or lines of two bites, and can remain itchy and inflamed for up to several weeks afterwards. Fleas can also lead to hair loss as a result of frequent scratching and biting by the animal, and can cause anemia in extreme cases. Combating a flea infestation in the home takes patience because for every flea found on an animal, there could be many more developing in the home. A spot-on insecticide will kill the fleas on the pet and in turn the pet itself will be a roving flea trap and mop up newly hatched fleas. The environment should be treated with a fogger or spray insecticide containing an insect growth regulator, such as pyriproxyfen or methoprene to kill eggs and pupae, which are quite resistant against insecticides. Frequent vacuuming is also helpful, but the vacuum bag must be disposed of immediately afterwards. Diatomaceous earth can also be used as a home flea treatment in lieu of acetylcholinesterase inhibitory treatments or insecticides which carry with them a risk of poisoning for both humans and animals. However, Diatomaceous earth is at least potentially dangerous to pets and people when inhaled, so care in use is recommended. Application is effective on both the interior and exterior of one’s property, but the efficacy of Diatomaceous earth is diminished when introduced to water. Because Diatomaceous earth is commonly available in food grade quality, it is also possible to leave it exposed in areas typically vulnerable to fleas and other insects. Baking Soda is also used to kill via dehydration, it’s available in large amounts as a food grade material and safe for family and pets when used inside the home (carpets and floors) a layer can be sprinkled onto a carpet and worked into the fibers down to where the larvae and eggs are to dehydrate and kill them. It can be easily vacuumed up afterwards with safe disposal… often multiple weekly treatments will be required to remove an infestation completely. Table Salt Can also be used inside the home in the same way as or in combination with Baking Soda as a low cost and safe method of breaking their life cycle. 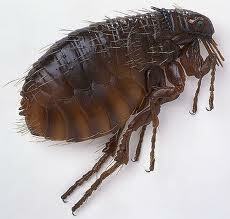 Using dehumidifiers with air conditioning and vacuuming all may interrupt the flea life cycle. Humidity is critical to flea survival. Eggs need relative humidity of at least 70–75% to hatch, and larvae need at least 50% humidity to survive. In humid areas, about 20% of the eggs survive to adulthood; in arid areas, less than 5% complete the cycle. Fleas thrive at higher temperatures, but need 70° to 90°F (21° to 32°C) to survive. Lower temperatures slow down or completely interrupt the flea life-cycle. A laboratory study done at the University of California showed that vacuuming catches about 96% of adult fleas. A combination of controlled humidity, temperature, and vacuuming should eliminate fleas from an environment. Altering even one of these environmental factors may be enough to drastically lower and eliminate an infestation. Flea infestations require multi-faceted treatment plans. Addressing a pet’s infestation or individual flea bites will not prove effective for ridding your home of fleas. Effective flea control should encompass both chemical and natural methods and should be conducted on your pet as well as inside and outside of your home. Of course the primary plan of action should be to examine your pet daily. Catching fleas early will hamper their effect on your pets and in your house. Fleas are not the only pests that can cause discomfort to your pet. Contacting your veterinarian and pest control professional will help you determine if the problem impacting your pet is fleas. They will encourage you before they arrive to ensure that your home is clean: vacuum thoroughly, sweep and mop hard-surfaced floors, wash all bedding and linens and clear the floor of debris. After taking these steps, your pest control professional will administer proper treatment to infested locations within and outside of your home. Your pest control professional may ask you to complete other tasks around your home in preparation for treatment. They can also help advise you on ways to prevent future flea incursions and the best shampoos once fleas are on your pets. Grey squirrels do not appear to be susceptible to Squirrel pox virus, but may carry and transmit it. Grey varieties eat seeds, buds, flowers, shoots, nuts, berries and fruit from many trees and shrubs. They also eat fungi and insects, and occasionally birds’ eggs and fledglings. They will strip bark from trees during the summer months. They molt their coat twice a year, once after winter and then in the late summer before the weather gets colder again. They live high in trees in a nest made from twigs, leaves and moss. This is called a drey. More recently they have taken to living and nesting in loft spaces. Average densities in broad leaf areas are approximately 8-18 greys per hectare, and 0.1-1 per hectare in coniferous areas. of the red squirrel population in the UK. The origin of squirrel pox virus in red squirrels is the introduced American grey. Research shows that the antibodies to the virus are very common in many grey squirrel populations in England & Wales (although not in Scotland until recently – 13 greys have tested positive for antibodies since June 2005) but only one case of disease has been found in a grey. Red squirrels are not found to carry the antibodies unless they are already succumbing to squirrel pox disease. It is therefore thought that grey squirrels act as a reservoir host for the virus. All wild-living red squirrels observed to be affected by squirrel pox virus appear to die within 2 weeks of becoming infected. As yet we do not know the route of transmission. Possibilities include transfer via saliva or scent marking secretions at feeding or scent-marking sites, or perhaps by ectoparasites (fleas, lice, ticks and mites) which may transfer from animal to animal in the dreys. The virus is unlikely to spread through the air if it behaves like other pox viruses. Further research in this area is needed. 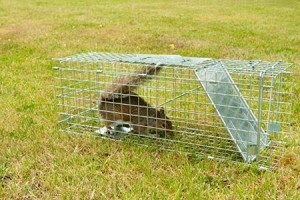 Live cage traps, either single or multi catch, involve attracting squirrels to a trap with a bait (food). These can be used in the same way as spring traps. Set at the base of trees and covered with logs. It is best to pre bait these traps, leaving the entrances open so that the squirrels can run freely for a few days before setting. The density of traps required depends on whether single or multi- capture traps are used. Single traps should be spaced 75-125m apart, multi traps 150-200m apart, equating to one trap per ha. In areas where it is difficult to draw squirrels to the ground – for example, pine mixtures, or where traps are disturbed by badgers, deer or wild boar – it may be necessary to site traps on platforms on the trees. Captured squirrels should be humanely destroyed by guiding them to one end of the trap, where they can be killed with an air rifle or the traps can be emptied into a sack and the squirrels dispatched through a swift, heavy blow to the head. Non target species should be released immediately. 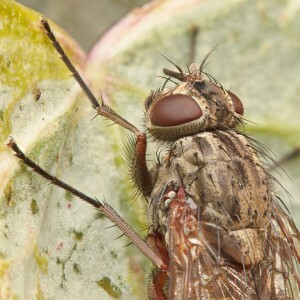 Cluster flies are large, slow moving, hairy, flies around 10-15mm with a dark gray to black non-metallic abdomen. The larvae of the flies feed on earthworms in grass pasture or lawn areas. Then in autumn and early winter the adult flies will move into homes and other buildings to survive the winter. They are named cluster flies because of their habit of congregating in large groups or swarms, often in dark places such as attics, corners of dark rooms, ‘nooks and crannies’ and ‘cracks and crevices’. 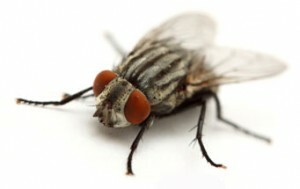 Each fly releases a pheromone (smell) that attracts others. This pheromone will linger on, even after all the flies have been destroyed and removed. Thus the pheromone will continue to attract cluster flies to that area and clusters will keep recurring. It is therefore important that treatments are continued even when there are no flies present. Why Are They a Pest? The flies congregate to survive through the winter and once warmer weather arrives in spring they emerge from their ‘hibernation’ to lay eggs on surrounding grassland, pasture and lawns. So there tend to be two times of the year that these flies bother us in homes and other buildings; autumn when they congregate and spring when they emerge from their hiding places. If you, or a neighbour, have had the problem in the past treat the likely areas of clustering in early autumn to prevent clusters forming. Spray with residual surface spay as described. If you have the adult flies swarming and clustering in the house or other building you need to carry out a full program of treatment. How do I get rid of cluster flies? Control is best achieved by finding and treating cluster fly resting sites and harbourages by applying a residual cypermethrin-based insecticide to alighting surfaces and by activating permethrin foggers or smoke generators to fumigate the area and flush them out. If initial treatment is carried out in the autumn months, a follow-up treatment in the spring is often advisable. 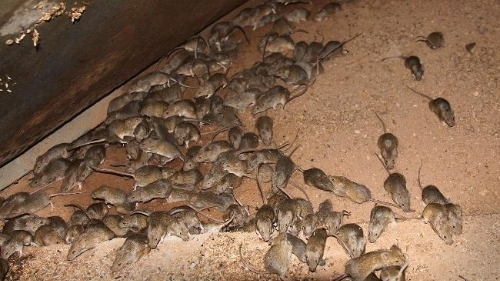 Rats and mice will invade buildings in search of food and shelter. In doing so they may be involved in the transmission of disease, soiling and destroying belongings, damaging equipment and can cause serious structural damage by gnawing through cables, water pipes and woodwork and so on. They also eat and destroy food stores. Rats can be a serious risk to health. They will destroy and contaminate food stores and carry many forms of disease including Salmonella and Weils Disease through their droppings and urine, some of which can be fatal to humans, although this is very rare. Mice, like rats, can spread disease including Salmonella. They contaminate food with their urine, droppings and fur. Mice will easily enter gaps of 5mm wide. They are very good climbers. If a pencil fits in a gap, then a mouse can get in! They prefer to nest in dark secluded areas with little chance of disturbance. Foraging territories are no more than 6 metres away. If there is abundant food nearby they can nest within 1.2-1.6 metres of the source. Droppings are around 4-8mm rod shaped, resembling a piece of lead from a pencil. Rats and mice need to gnaw to keep their constantly growing incisor teeth worn down and they damage woodwork, plastic and lead pipes and will sometimes strip insulation from electrical cables. Holes made by mice tend to be 20mm in diameter in walls etc. whereas rats tend to be 80mm. Rodents having established the best route from one place to another use it frequently and this “run” becomes soiled with grease and dirt and leaves a “smear”. Footprints are sometimes apparent on dusty surfaces. 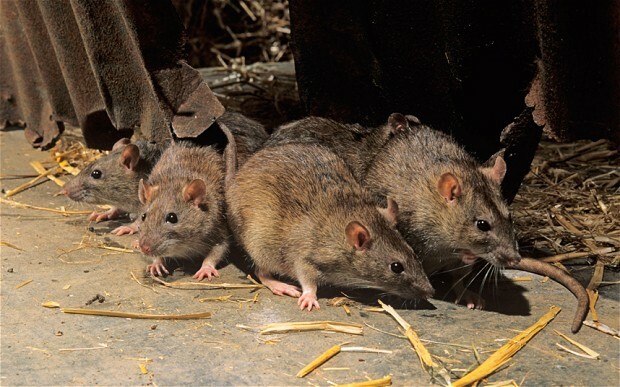 Finally, the faeces or droppings of rats and mice are a good indication of the cause, size and duration of the infestation. Rat droppings – 10mm spindle shaped, usually round corners. Unusual smells – a longstanding problem can create a stale smell. Holes – which appear in the garden, approx. 7-12cm in size with a pile of earth near the entrance. Rat runs – a continuous depression in grass or other low vegetation, a smooth pathway may be visible on bare earth. 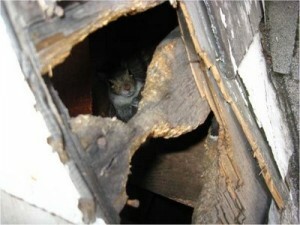 Gnawing – often to the bottom of wooden doors and sheds. Scattering – of compost being dragged out of bins or heaps. Droppings in drawers and cupboards. Food packets nibbled and chewed. Soap and candles chewed and nibbled. Keep your property in a good state of repair and closing small gaps. A rat can get through a space as small as 10mm high. Remove sources of water and food – this includes food left out for the birds and other animals as it will also attract rats. Windfall apples and other fruit should also be cleared up as soon as possible. Covering the ends of exposed downpipes with chicken wire or other suitable material as rats will use downpipes as a means of climbing to roof spaces. Special attention should be given to compost heaps which should be kept contained and tidy. Pet foods and other food products should not be stored in accessible areas such as garages and sheds. Kitchens should be kept clear of spilled food and no food should be left out but should be stored in a suitable container. Keep your property in good repair and close or fill any possible entry holes. While there are many things you can do to control rodent problems, serious infestations may need professional help to be successful. With all pest control operations much can be achieved without the use of pesticides. Removal of food, water and harbourages (this is anywhere rodents could build their nest) will deny rodents their main requirements for survival. Repair of damage caused by rodents or rodent proofing may be required but should not be attempted until the pest control operative has visited and suitably treated. Advice on necessary precautions will be given to prevent further problem. Bedbugs look a bit like lentils. They are oval-shaped, flat and reddish-brown, and up to 5mm long. Females lay 200-500 eggs over a two-month period. These white specks stick to surfaces and are very difficult to spot. They hatch to form tiny straw-coloured insects that take about six to eight weeks to grow into adults. As they grow, they shed their skin. This looks like mottled brown shells on your mattress. Bedbugs need to feed on blood to be able to mature, but they are very resilient. Adults can survive for up to a year without feeding. 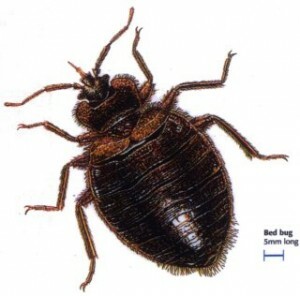 They are not attracted to dirt, so a bedbug infestation is not a sign of an unclean home. Look for any unexplained skin rash or itchy bump (not everyone develops this though). Look out for black spots on your mattress. This could be their dried faeces. Look for mottled shells that bedbugs may have shed. Check your sheets for blood spots where you may have rolled over and squashed a bug just after it had fed. Inspect all the crevices and joints of your mattress and furniture using a torch, and see if you can spot any bugs. You should treat all affected areas and those immediately surrounding the bed as well as any other areas where bed bug activity has been noticed. In addition, activating Foggers or Smoke Bombs will help fumigate the area, and hard-to-reach areas can be tackled with an aerosol spray. Depending upon the extent of activity, repeat applications may be necessary at two-weekly intervals. Highly recommended are our Bed Bug Killer Kits, which contain a number of products including a Bed Bug Killer Spray, Bed Bug Killer Powder, Foggers or Bed Bug Spray, along with an advice sheet giving step-by-step instructions on how to carry out a professional bed bug treatment. 1. Remove pets (including fish in fish tanks) from any rooms that are to be treated and keep them out until all treated surfaces have dried. 5. Inspect the mattress, paying particular attention to the edges where stitching appears. Also check around and underneath buttons if your mattress has these. Lightly apply spray to any affected areas, taking care not to soak the mattress. Allow to dry thoroughly before replacing bedding. 6. If your bed is a divan with drawers, remember to check inside these, ideally removing them to inspect and treat if necessary. Divan beds normally have a hessian/plastic cover on the base, please check around the edges of this for bed bugs and treat with spray. 7. If your bed has slats, please remove these for inspection as they often have bed bugs living between them and the frame of the bed. 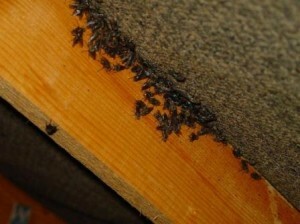 If your bed has a headboard, always check this as this is a common area where bed bugs are often found. Apply spray to these areas. 8. Be sure to inspect and treat along the edges of carpeted rooms, paying particular attention to the area around the bed. Inspect the inside of and bases of nearby furniture, including bedside tables/chests of drawers and, if possible, wardrobes. Apply spray to any areas where there are signs of infestation. 10. Spray should be used in hard to reach areas the fine mist aerosol will penetrate better than the trigger spray. 11. As spray leaves a residue that is effective for a number of weeks following application, try not to clean for a short while after treatment as this will remove the insecticide, or alternatively reapply the spray after cleaning. 12. Once the spray has been applied, activate Fogger following the directions on the canister. Leave the room for approx 3 hours and then to allow the gas to disperse, you should open windows and doors as this will ventilate the room and allow the insecticide to dry quicker. 13. Powder should be applied to divan bases, bed frames and floor area around bed. Powder will adhere better if surfaces are slightly damp; however, to avoid the powder congealing, carpets should be allowed to dry thoroughly before applying. DO NOT APPLY DIRECTLY TO MATTRESSES. Please ensure pets and/or children are kept away from treated area until powder has been removed. Rats are suspicious of new objects and rat traps with only one entrance. If they see other rats have been trapped they may also avoid the trap. Traps which do not address these issues are likely to catch only young, inexperienced rats, not the older ones. Spring traps designed for rats are powerful enough to break a rat’s neck or spine. They may break human fingers as well, whereas an ordinary spring-based mousetrap is very unlikely to break a human finger. Rat spring traps may not be sensitive enough to spring when a mouse takes the bait. 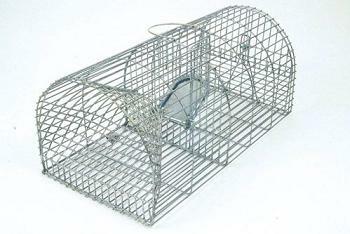 A rat cage trap is a metal cage box-shaped device that is designed primarily to catch rats without killing them. Food bait (not poisoned) is put in the cage trap. When an animal enters the cage and moves toward the bait, the mechanism triggers and closes a door over the entry point. The animal is caught alive and without injury. The animal can be transported and released elsewhere or subsequently killed. Glue traps are non-poisonous sticky glue spread over card boards and the like and kept in places rats frequent, which gets them stuck to it when they pass over it. A bait may also be placed on the cardboard to attract the rats. Another form of non-lethal trap is one where the wires it is constructed of are cut and formed into a funnel shape directed into the body of the cage. This design is usually dome shaped with the funnel at the crown. Rats are extremely flexible and can push through the narrower opening into the cage, but cannot escape due to the ends of the wires poking them in the face . The advantage of this design is that it can catch more than one rat at a setting. Other types of traps are designed to kill the animal. Electronic traps detect the presence of a rodent via metal plates on the floor of the trap, then deliver a lethal dose of high voltage electricity stepped up from batteries to several thousand volts. Some brands offer remote indication to tell you when the trap has operated. The full metal construction of the trap is robust and yet easy to set, the trap with its solid base together with a powerful mechanism. The strength of the trap and results seen from it, far exceed that of the wooden or plastic alternatives. 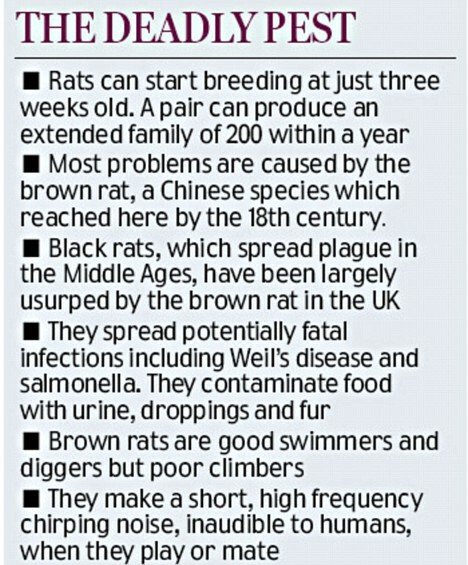 Britain’s rat population is soaring to record levels. The abolition of weekly bin collections, a succession of mild winters and the summer floods are to blame for the rising numbers, rat catchers say. The fast-food culture which sees towns and cities covered with half-eaten burgers and pizzas most Friday and Saturday nights is also fuelling the epidemic. Yet despite the threat to public health, a growing number of town halls are discouraging households from complaining about rats by charging up to £80 a visit for pest controllers. Found rat droppings, spotted signs of gnawing, heard scratching or scurrying at night or seen any other evidence of rodent activity? If so, you most likely have an infestation. Whether a householder or business owner, you can get everything you need from poison to glue traps in order to stop rats multiplying, causing damage and spreading disease! The warning follows a 20 per cent rise in pest control call-outs over the last year. 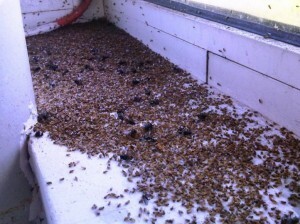 In the worst-hit cities, such as York, the number of reported infestations has more than doubled in the last 12 months. 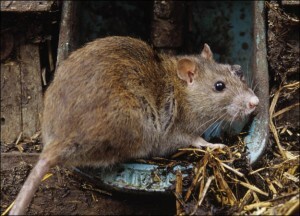 Exeter City Council reported a 66 per cent rise in vermin call-outs last year, Salford a 40 per cent rise and Carlisle a 142 per cent increase. 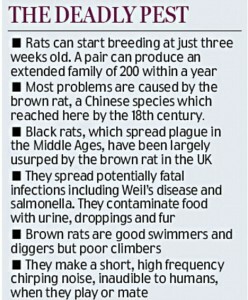 There are no official figures for the UK’s rat population. Estimates vary from 15million to 100million. However, Iain Turner, a director of the National Pest Technicians Associations, which represents pest controllers, said: ‘What we do know is that in the last two years there has been a significant increase in sales of rodenticides to professionals. The summer floods of the last two years which saw drains overwhelmed with rainwater have also forced rats to seek homes in gardens and waste ground. Some experts say the introduction of alternate weekly collections, where food is allowed to rot in bins for up to two weeks before being taken away, has added to the crisis. Most councils use rat-proof wheelie bins with lids to stop vermin reaching food waste. However, the axing of weekly collections has led to hundreds of thousands of homes composting food scraps for the first time. While councils are eager to help householders turn food waste into compost, few provide composters with rat-proof wire meshes to stop rodents burrowing in. 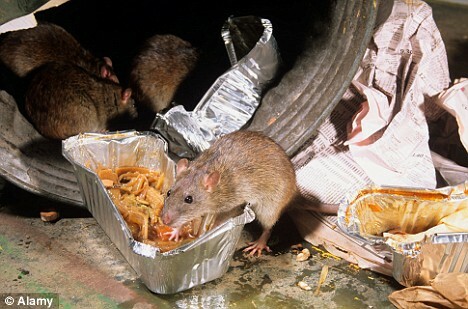 Many councils demand up to £80 to tackle infestations in homes and gardens. Where councils introduce charges, the number of call-outs falls. Water firms are also failing to tackle infestations by routinely baiting sewers and drains, experts say. If you notice small balding patches in the corners and at the edges of your carpets, the chances are that you have an infestation issue. This is a problem that needs immediate attention because it will continue to get worse. Carpet moths are stubborn when it comes to leaving. 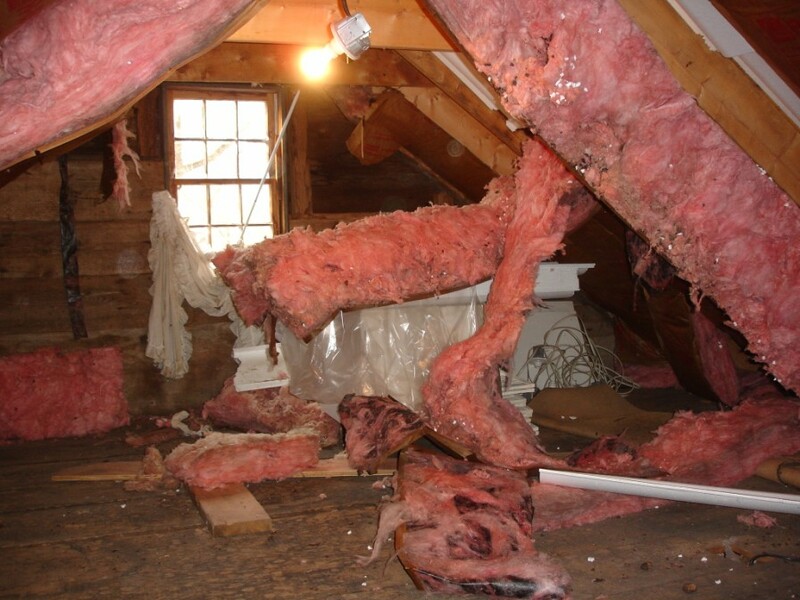 In the last few years we seeing more and more severe infestations. This is not a problem connected to dirty environments, indeed they actually seem to be quite discerning where they dine! Usually, the treatment is to loosen the carpets and spray underneath, and then to spray the carpet pile, thus ensuring the moths are thoroughly zapped! It is possible furniture may need treating too as this may be harbouring them (they find furniture equally delicious). Look out for coloured grubs! It is not uncommon to find grubs the same colour as your carpet fibres as this is what they have eaten. You must remember, wool is basically a protein coming directly off the bodies of living sheep. Whilst polypropylene and nylon carpets are not natural dietary fibres, I have been told by customers in the course of my travels that moths have attacked them, although I have not seen this myself. The usual cause of this is human and pet residue on the synthetic fibres such as oils and hair. Carpet Moths, Case Bearing Moths, or Carpet Beetles are the creatures most commonly associated with damage to carpets, rugs and textile floorings. Holes in carpets, or threadbare patches where flooring has been eaten away is usually a sign of a carpet moth infestation. 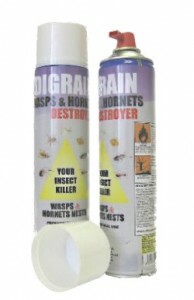 Below you will find a complete range of products and treatments to enable you to get rid of the pests once and for all. 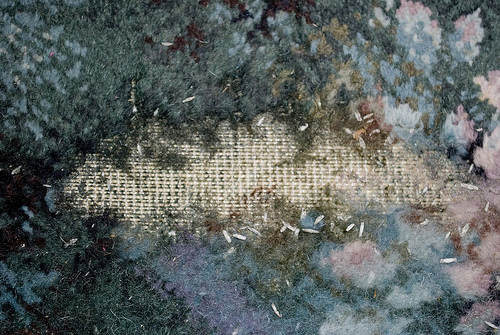 Known as textile pests, like the clothes moth this species feeds predominantly on ‘keratin’, a substance found in natural fibres, which often results in damage to carpets or rugs containing wool or silk. Other materials they will feed on include cashmere, viscose, feathers and hides. Establishing exactly which type of infestation you have, whether it be Carpet Moths / Case Bearing Moths or Carpet Beetles is not particularly important, as the treatment process is very much the same, regardless of species. 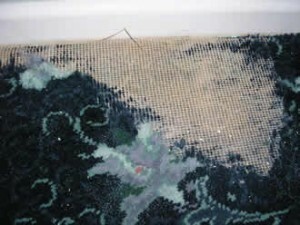 Carpet Moths favour dark areas, with damage often being more evident underneath or behind heavy furniture. Having passed through the lifecycle stages of egg, pupa and larva and finally reaching adulthood, the fully developed moth rarely flies, but instead runs quite rapidly across floors, tending to avoid direct light. Carpet Moths or Case Bearing Clothes Moths are usually dark buff in colour. The cases they shed during their life cycle can sometimes be found and are described as looking like grains of rice. What is the best carpet moth treatment? Firstly, when dealing with an infestation it is important to ensure that you are applying the appropriate products, that they are suitable for carpet application and of course manufactured to a high standard. In terms of ‘the best treatment’, carpet moth killer kits usually provide the best method and fastest route to total bug eradication. This is because they contain a combination of products which provide a crossover of active ingredients. This crossover is one of the key factors in effective pest control, as it provides a far better knockdown effect than that of a single product. Rodent baits, also known as mouse poison or rat poison offer an economical and efficient approach to controlling rodent populations. The poison come in either pellets or blocks. Bait packets are useful as they keep the poison away from you while placing the poison in the proper location. Also, rodents must gnaw through the covering, therefore you can determine whether there was rodent activity involved with the bait. Pellet baits and place packs are prone to being carried away and stored in different locations. For this reason, the baits can come in contact with pets and children. Placing the packs in nests or burrows is encouraged in order to control large populations of rodents. Block baits come in a unique shape that’s designed to provide rodents with an attractive gnawing item. Typically, block baits are nailed to a piece of wood in order to prevent it from being carried away and allow you to monitor whether it has been gnawed or is still intact. In most cases, it makes little sense to evenly place baits in a room if the rodent activity is located in one or two specific areas. When used properly, mouse poison should not harm pets or children, but it is important to remember that it could harm wildlife and children. Be sure to take extra precautions against accidental poisons. Also, remember, poisoned rodents may die anywhere; they may die in an inconvenient location. However, most of the time, poisoned rodents succumb to the poison and die in their nests. The poison that is used by professionals is Bromadiolone as it has a higher toxicity to rodents than many other anticoagulants. It is perfect for eradicating rat infestations in both indoor and outdoor domestic situations such as in gardens, sheds, lofts or roof spaces, or beneath kitchen units, as well as being suitable for use in commercial contexts such as in warehouses, factories, restaurants, food premises, and farms. Recommend changing bait out every 40-60 days if not eaten. Very cold or warm temperatures will mold or sour the bait faster. Apply bait in locations out of reach of children, pets, domestic animals and non target wildlife, or in tamper-resistant bait stations. Used in tamper resistant bait stations or areas inaccessible to non target animals and children. 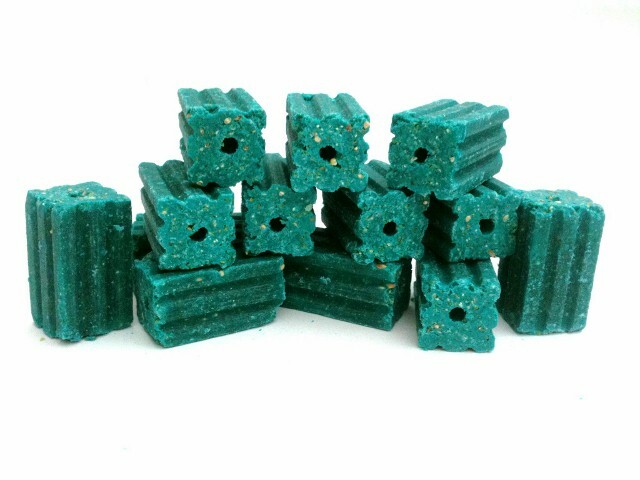 Multiple edges on these rat poison blocks appeal to a rodent’s desire to gnaw, are made with food-grade ingredients and small amounts of paraffin for a highly palatable bait which holds up well, particularly in adverse or moist conditions, superior rodent acceptance and control including control of Warfarin-resistant rats. Bed bugs are sneaky and lurk where you least expect. Learn here how to spot them and get them before they get you. Bedbugs – that pest from the old bedtime rhyme (night night, sleep tight, don’t let the bedbugs bite) – are making a comeback. More of a nuisance than a health hazard, they are sucking blood from you when you sleep. Adult bed bugs are wingless insects about 5mm long and oval in shape – similar to a lentil. Their colour is nearly white after moulting, then ranges from tan to burnt orange. After a blood meal, they’ll appear dark red or black. Their flat bodies enable them to hide in dark, cosy cracks and crevices in beds, skirting boards, sofas and drawers, and even behind wallpaper and electrical socket plates. That’s where they nest during the day, typically not far from where they’ll find their host – that’s you – at night. These little bloodsuckers dine on you without causing you to lose sleep. The next morning, you’ll discover lesions that resemble the bite of a mosquito or other insect. 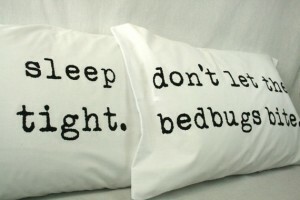 Bedbugs are not attracted to dirt, so having bedbugs doesn’t mean a hotel, home or dorm is not clean. Although they live on blood, adults can live for a year between meals, so just because a room hasn’t been used for some time doesn’t mean it will be bug-free. They could just be dormant. 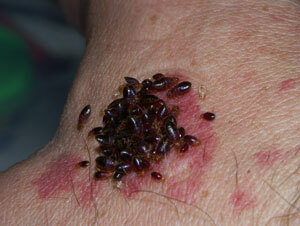 Bedbug bites can lead to itchy red bumps a day to nine days later. These often happen on the face, neck, hands or arms, although not everyone has a skin reaction to a bedbug bite. Bedbugs don’t transmit any human diseases, but that doesn’t mean they should be ignored. Females lay 200-500 eggs in two months, so you could have lots of unwanted company very quickly. 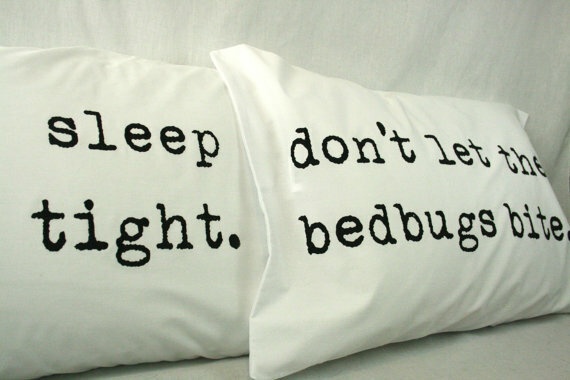 Because bedbugs live where you sleep, extra care is needed with pesticide to avoid over exposure where you sleep. If you do decide to use special bed bug insecticide spray yourself, always read the label. Never use these treatments on clothing, linen or a mattress. Pest Expert Formula ‘D’ is a fast-acting bed bug killer spray which, as well as killing bed bugs on contact, also leaves behind a highly effective residue, providing longer-lasting bed bug control. This bed bug spray can be used to treat bed frames, carpets, mattresses and even bedding. Search the bedroom. Look in folds and creases in mattresses and box springs, joints of bed frames, pleats of curtains, behind loose wallpaper, in spaces of wicker furniture, behind cove moulding, and in corners of drawers. You may notice dark brown or reddish faecal spots on bed linen, mattresses or walls near the bed. When you find an insect compare it with the image in this article, or put the bug a plastic bag or bottle to show to an expert. Bedbugs are savvy and lurk where you least expect. Learn here how to spot them and get them before they get you. Consider dumping a mattress if it looks heavily infested. Inspect older beds, especially in rented accommodation. Using a torch may help. If you suspect a hotel room, don’t unpack until you are sure. 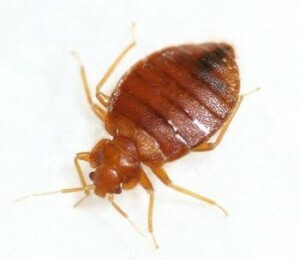 Bedbugs can hitch a lift in your luggage. If any clothes or bed linen are infested, wash them on a hot 60 degrees wash or put them in a tumble dryer on a hot setting for 30 minutes to kill any bugs. What about the bedtime rhyme? Bed bugs have been bugging humans for years. They’re mentioned in ancient Greek and Roman writings and the Talmud. Most of us grew up hearing, “Night night. Sleep tight. Don’t let the bedbugs bite.” Where did it come from? Other bloodsuckers such as fleas could also attack the hapless sleeper. You might presume that to “sleep well” meant getting through the night without providing a banquet for bloodsucking insects. 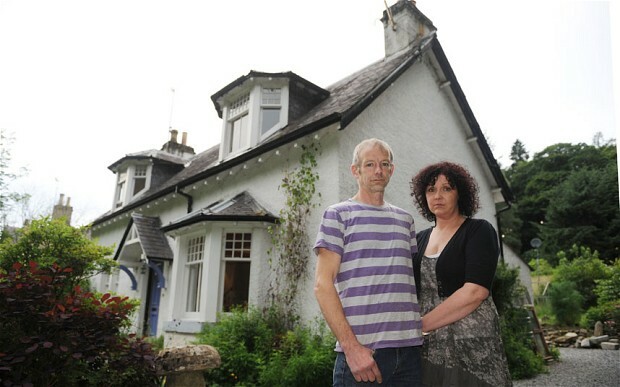 After calling for much needed help from channel five home improvement program Half Built House, Colin Gibson and Judi Campbell, a Scottish couple from Pitlochry in Perthshire were left with their 120 year old cottage back to square one with problems that weren’t even there before. After struggling to keep on top of the renovation work in their beautiful Victorian home, Judi and Colin were left with what they have described to be the builders “botched jobs” and were made to look like “fools” after channel five home improvement program left their home with uneven flooring, a window that had been painted over, an extractor hood that is far too low and much more. The TV show Half built House that is presented by Sian Astley who is a DIY and home design enthusiast and expert, were called in to work on Colin and Judi’s home in May and it was last night, 10th July 2012, the Perthshire episode was shown on TV which had the middle aged Scottish couple full of anger. The antique hand rail which took pride of place on their landing was replaced with what Mr Gibson said “looked like it had been fitted by a 12-year-old”. He said one of the builders used an industrial sander on their wooden flooring and had left it looking like the “Sahara Desert”. After the OFT Office of Fair Trading stood in to make a change, 12 airlines will now be advertising their Credit and Debit card charges when you go to book a holiday. In a bid to cut unfair sales of flights tickets with hidden fees the first 12 airline companies will be making a change and hope that other companies follow. On average, consumers spend £300m on hidden card surcharges each year and head of OFT, Clive Maxwell wants to put a stop to this. “This is a great outcome for the millions of people who buy flights online”. “It is important that the cost presented when they search for a flight is realistic and that they are not surprised by extra charges”. Easyjet, Ryanair, Wizz Air, Thomson, Thomas Cook, Jet2, Lufthansa, German Wings, Flybe, Eastern Airways, BMI Baby and Aer Lingus are the first 12 airlines to take note and make a change. The price of French holidays is expected to rise as president Francois Hollande plans to increase tax on foreign homowners. The news comes from the announcement recently made for the need to reduce the countries large budget deficit and the only way to do this is to increase taxes. And it seems that the only taxes that will be raised are those that we British holiday home owners pay. According to the French finance minister, around 60,000 properties will be affected when a tax increase of around 20 percent will be added to rental prices and 19 percent to sale prices. So how can you get around this making it more cost effective for you? It seems that if you already rent out your property in France or you are planning to, you have to increase the price to cover your cost. Selling isn’t really an option as you will lose out here too. Those of you who choose to sit tight and just accept the increase taxes may be all right if you have a small or nonexistent mortgage on the property. Mini has gone commercial creating a tidy and trendy van that doesn’t actually look like a van. Turning the Clubman into a Clubvan, BMW Mini have made the first compact, comfy and stylish commercial vehicle to suit all your working needs. 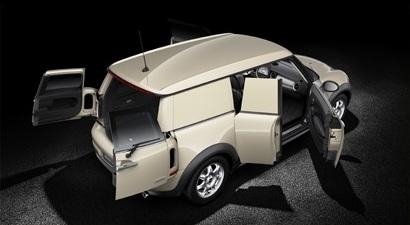 With five doors, two seats and a partition wall separating you from your cargo the Clubvan has been described as ‘when business meets pleasure’. 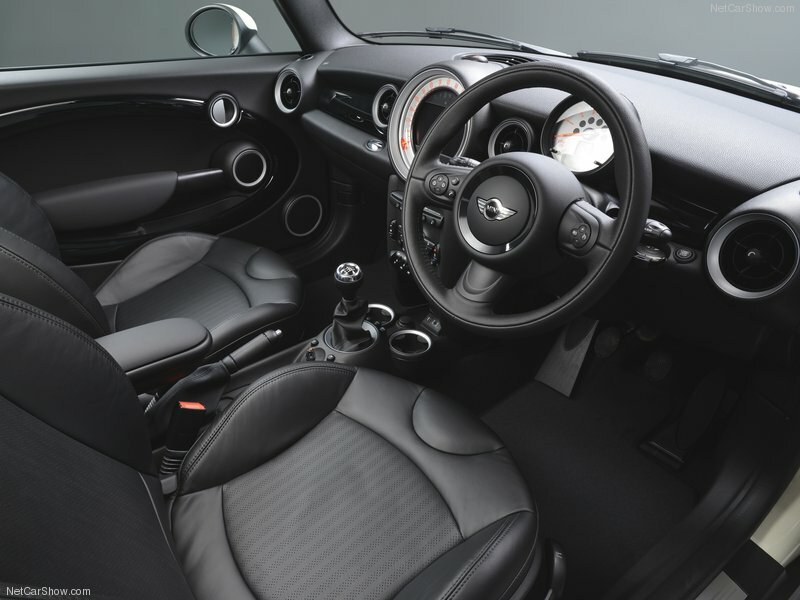 Recently launched at the Goodwood festival of speed, the new mini Clubvan will be available in three different versions, a 98bhp Mini One Clubvan, 122bhp Mini Cooper Clubvan or the 112bhp Mini Cooper D Clubvan starting at a minimum of £11,175 for the Mini One. By visiting Mini’s website you can design your new van to be exactly how you would like it to be with a choice of four classic colours and an ultra modern interior there is no other van on the road like it. Mini have now created luxury family cars, comfortable 4×4’s, speedy racing cars and now the commercial vehicle we will all be intrigued to see if a pick up will come from this now. 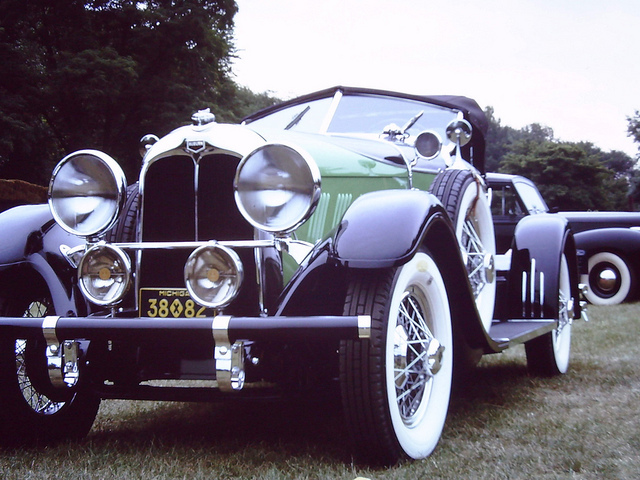 Mike Penning, road Minister has agreed to exempt any classic car manufactured pre 1960 from MOT testing as of November 18th 2012. Due to the number of classic vehicles left on today’s roads and the statistics in which accidents are involved with them it seems to be common sense to do away with MOT’s on these beautiful cars as owners take such pride in looking after them even if they do only come out of the garage for a few months each year. 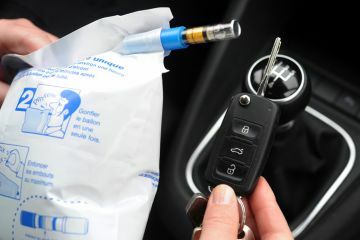 As of July 1st 2012 the French government has ruled that all motorists in the country have to carry a breathalyzer kit in their vehicle or face a fine, this includes foreign visitors too. In a bid to reduce the numbers of road deaths caused by drink driving, the French government believe if motorists can check their alcohol levels before setting off 500 lives can be saved as a result. Many are saying this is simply a way of making more money out of road users, as if fuel prices, tax and insurance costs weren’t high enough, all drivers in France now have to spend money on a breathalyzer kit along with the already enforced practice of a high visibility vest or jacket and a warning triangle. If found without a breathalyzer kit in your vehicle you face a fine of $11 (£9) but you are expected to purchase these kits first for a minimum of £3.00 for a disposable kits or £100 for a digital version. The new law has already been put in place but fines will not be issued until the 1st of November 2012 due the fact that there are simply not enough breathalyzer kits to go around so companies are currently manufacturing them thick and fast. So many believe that is purely a way of making money since the French daily paper, Sud Ouest, reported that the president of the anti drink driving lobby, Daniel Orgeval, also works for the one of the two leading breathalyzer kits manufacturers, Contralco. It seems too much of a coincidence that Contralco released their latest product after being in financial difficulties right before the new law has been put in place. While this is a good idea and should drum into road users heads that they cannot get away with drink driving, it is coming across that this is simply a money making scheme. What do you think? Slug numbers are expected to keep growing if we do not see a spout of dry and hot weather this summer. After the unpredicted weather that has been seen across England and Scotland it wasn’t just the rivers and lakes that benefited from the amount of rainfall received, but the slug population has boomed and has supposedly doubled due to the perfect weather conditions that they like. 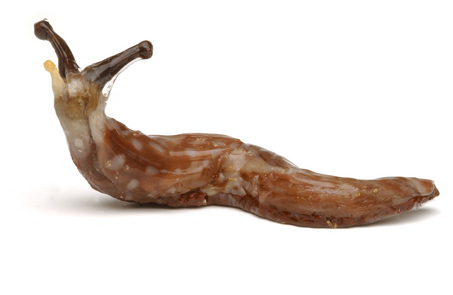 While this is good news for the birds who thoroughly enjoy snacking on a slimy slug, all farmers are expected to see crop shortages this year after the slug numbers are expected to have doubled after a frost free winter and mild and wet spring. So for all potato farmers and potato consumers expect to see numbers fall and prices rise this year thanks to our unwelcome slimy pests. B&Q have said that their sales in slug pellets have already risen by 44% this year compared to last and stores in Scotland have said to have sold double the amount of slug pellets this year. So what to do to protect our gardens? Lay gravel or egg shell around your prize plants, this will hurt the slugs and will not travel across it. Gather some margarine tubs or tuna tins and bury them a little way into the soil, now poor some cheap and fizzy beer into them, the idea is that the slugs love the smell of beer and will fall into the containers and drown. Another tip is not to leave your grass cutting on the lawn, rake it up and put it in the green bin or take to your local tip, slugs find cut grass a perfect habitat. And lastly, pop out some bird feeders and encourage the birds into your garden, they will find the slugs and do the cleaning up for you.